UPDATED 9/14/17 For COMP M5 AAA sight. First lets look at the differences between the “H” series and the “T” series sights. For the vast majority of folks out there there’s no advantage in selecting the T series over the H series. When was the last time you took your rifle greater than 5 meters underwater? The only possible reason for getting the T series is if you’re planning on getting night vision for the rifle. My advice is to save some money and go with the H series of sights. The battery life and durability are exactly the same. Buy a few extra mags or ammo with the savings. Now that we’ve established the differences between the H & T series, let’s take a quick look at the different “generations” of each sight. The H1/T1 one comes with the “bikini” covers pictured below. It’s a very low cost but effective means of protecting the glass when not in use. There’s some obvious drawbacks to these but I suppose it’s better than nothing. There’s also flip covers available for an additional cost. The T2/H2 sights come with the flip covers which are actually pretty nice. The H2 has clear covers on the front and back so you have the ability to use the sight with them still in the closed position. The T2 has a clear rear cover and a black front. One thing to take into consideration is that if you’re using a magnifier it will require you to have the magnifier slightly further back than if you were using the bikini covers that come with the T1/H1. The covers are removable so you still have the option of removing them if needed. Looking at the pictures below you can notice how the H1/T1 series have the elevation knob somewhat exposed and with the H2/T2 series they have some protection built into the body of the sight itself. When compared side by side you can notice that the H1/T1 appear to have a blue tint to them, while the H2/T2 have a more natural look and also greater contrast. One common complaint with the H1/T1 was the distortion of the dot when using a magnifier. Aimpoint has resolved this issue with the new generation of sights as you can see below. Another improvement (although hard to illustrate via the interwebs) is the brightness adjustment knob. The H2/T2 have a smoother knob and a more pronounced “click” at each setting. It’s impossible to show you through a blog post, but when felt side by side you can easily notice a difference. How does the COMP M5 compare? On September 12th, 2017 Aimpoint released the new COMP M5 sight which is a AAA powered sight roughly the same size as the incredibly popular Micro line. It weighs 5.19 ounces (A T2 weighs 3.4oz) and is 3.3 inches long (T2 is 2.7″). The main features of this sight is the use of AAA batteries which are inexpensive and readily available all around the world. This sight was initially developed with Military and PMCs in mind operating in remote areas where other batteries (2032, 1/3N etc) may be harder to source. It has all the features you’d expect from an Aimpoint including over 5 years of battery life, fully submersible to 150 feet (45m), NV and magnifier compatible and is supposed to feature clearer glass and improved dot clarity. We don’t know much for now but we will continue to update this article as more information and real world reports come to light. We expect to have he COMP M5 sights in stock available for shipping around the end of September 2017. You can view the PRODUCT PAGE HERE. The COMP M5 is 100% compatible with existing MICRO H1, H2, T1, T2 mounts. The mount options are identical. Every Aimpoint Micro is offered with the exact same mounts and any Micro mount is compatible with any Micro sight. There are no differences between the H & T series or the 1st or 2nd generations. The mounts are the same. These mounts are even compatible with the new COMP M5. As you can see, the 2nd generation (H2/T2) is superior in every way. If you already have the 1st generation (H1/T1) I probably wouldn’t feel the overwhelming desire to get rid of it and go out and buy the new version immediately. It’d be nice to have, but not something that I have to have right now. If you’re buying a new sight altogether, I think the choice is pretty clear. Go with the H2/T2. Hopefully you found this informative and it provided you with the information you need to make the best decision for your needs. Thanks for reading. 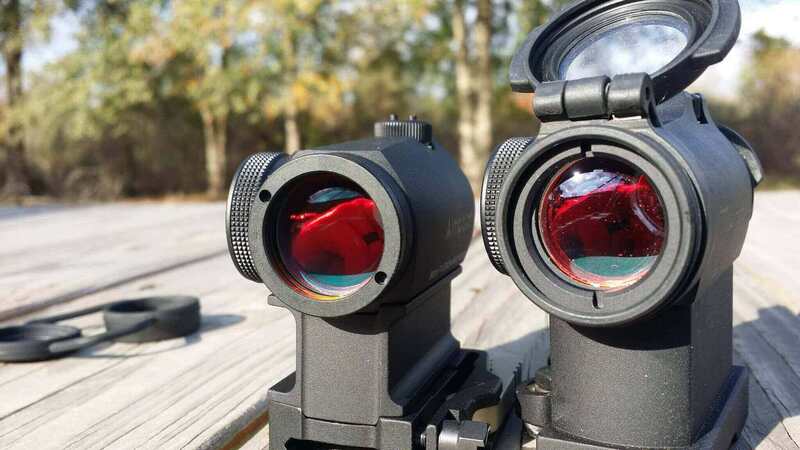 Some other great articles relating to the use of Red Dot Sights like these. You did not cover the mounts and if H2/T2 have the same mount holes/ capabilities as the H1/T1? Thank you for the review. You just saved me some money. I’ll also take the advise of getting extra magazines with the savings. Thanks, after your review it made easier to order a sight!!! For shooting pigs and dingo’s, in the outback of Australia, my Winchester 30-06 needs one of these. why does aimpoint continue to manufacture the h1/t1 if the 2nd gen version “h2/t2” basically fixes the flaws from the first ones…. Great info and helps in my decision over triji or eotech. Io sto usando micro h1 da 5 anni ,lo uso alla caccia al cinghiale ,ho abatutto cingo a 150 m e perfetto grazie aimpoint. Io sto usando micro h1 da 5 anni a caccia al cinghiale, ho abatutto cinghiali a150m e perfetto grazie aimpont. Re: D. Smith — H1/T1 is smaller and may be better proportion for specific handgun. This is the best review of T1/2 and H1/2 I’ve read. Superior in every respect! Thanks. I wonder if your statement “any Micro mount is compatible with any Micro sight” is accurate. I believe the H2 is slightly longer than the H1 (covers off) making the micro mount for a Ruger Mkiii/iv pistol impossible to use; all I know is that you cannot access the mount screws, as the H2 extends over them. Is Aimpoint close (or have they) to releasing another new generation ( H-3 /T-3)?